Hummingbird feeders are a great project for birders of all ages. Seed feeders attract many different types of birds, from sparrows to cardinals and finches and more. But feeding hummingbirds requires a little more thought and is very rewarding, as once hummers find your feeder, they will be there consistently for you to see. 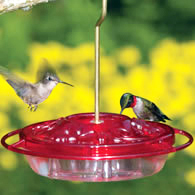 There are many different brands of hummingbird feeders, and most of these feeders have red “flowers” at the feeding tubes, which helps hummingbirds locate them. The type of feeder doesn’t really matter. What matters more is that you keep the sugar water out consistently, and change it often. The recipe for hummingbird nectar is simple — pour one part sugar to three parts water into a clean pot, then boil it over the stove for a few minutes until the sugar dissolves completely. Allow the water to cool entirely to room temperature before placing it in the hummingbird feeder, then place the feeder outside. Keep the hummingbird feeder in a shaded place, but in an area that is easily visible to any hummers passing by. Change the water at least once every three days. Sugar water ferments and can be deadly to hummingbirds. If it is really hot out you’ll want to change the solution more often, as the liquid will ferment faster. You can put the rest of the sugar water in the fridge and it will keep for up to a week. Just make sure it reaches room temperature again before you put it out for the hummers to drink. It is also extremely important to keep your hummingbird feeder clean. Sugar water can attract mold and bacteria, so clean your hummingbird feeder with gentle soap and thoroughly rinse before you put it out again. You want to help hummingbirds, not accidentally spread infections at your feeder. You will see hummingbirds flitting to and from your yard, and you’ll even get to see them stand still for a little while so you can snap a picture! Just make sure you’re responsible with your feeder by keeping it clean and changing the sugar water often.